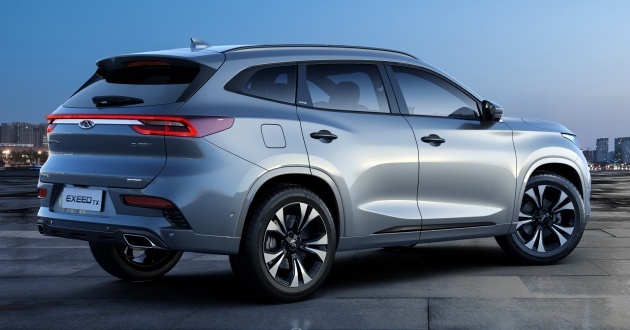 Chery announced previously it will be introducing a new nameplate for the European market, and a compact SUV will be the first model to lead this effort. Here it is then, the Exeed TX, which was unveiled in pre-production form at the 2017 Frankfurt Motor Show. The Exeed TX exhibits the evolution of Chery’s ‘Life in Motion’ design philosophy, and rides on a new platform (M3X) that was specially developed for the Exeed model line-up. It boasts support for electrified powertrains, in line with the company’s aim to sell a range of hybrid electric vehicles (HEVs), plug-in hybrid electric vehicles (P-HEVs) and battery electric vehicles (BEVs). At the front, the Exeed TX features a sizeable, pin-style grille that houses the Chery logo and accompanying light bars beside it. These meet up with the daytime running lights that are part of the SUV’s LED headlights. Typical SUV lines are visible from the side, and you can see a clear distinction between the wheel arches and body panels where plastic sideguards are usually found. At the rear, there’s a hint of the Kia Sportage, but with a different design for the taillights, which are U-shaped in appearance with a chrome trim linking them. 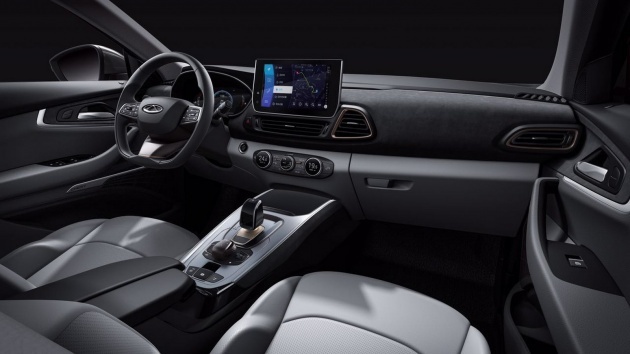 Moving inside, the dashboard is dominated by a large, 10-inch touchscreen that is linked to the car’s infotainment system, along with the switchgear on the centre console. Speaking of buttons and dials, those Audi-esque controls for the air-conditioning system also come with small touchscreen displays. An LED and will alternate between shades of blue and red, depending on the quality of air entering the cabin. Other bits of kit include a seven-inch digital instrument cluster, a 360-degree camera, heated seats, panoramic sunroof, ambient lighting, powered tailgate and park assist technologies. The SUV is fitted with 19-inch wheels, with tyres supplied by Continental. 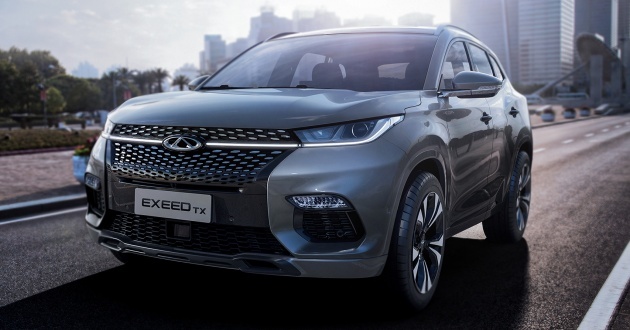 The Exeed TX will be offered in three versions – HEV, PHEV and BEV – with the middle one being the configuration go on sale first. The PHEV powertrain will combine 1.5 litre petrol engine (147 hp) with an 85 kW (114 hp) electric motor, all-wheel drive and seven-speed automatic transmission. Chery claims the compact SUV will sprint from zero to 100 km/h in just six seconds, with a top speed of 200 km/h. It also adds that the Exeed TX will offer a fuel consumption of just 1.8 litres per 100 km (NEDC), and can travel up to 120 km/h for up to 70 km running on electricity alone. No details about the battery were provided, but the company claims it will fast charge to 80% in only 30 minutes, and reach full charge from a 220-volt household power supply in just four hours. The Exeed TX will be one of several cars under the ‘Exeed’ banner destined for the European market. I think Chinese carmakers have entered another phase in their car design level. Let’s be honest, without the badge, you would have thought this is some continental or japanese makes. This is higher end and looks so much like a real SUV than the XC90 T8. Holy crap, I thought this was a concept car. Damn the Chinese are getting better and better by the day, this design puts most, if not all, Japanese, Korean and some German designs to shame. Meanwhile at Proton, they’re still “facelifting” the Preve. wah, bila masuk malaysia.. .since we got very good incentive. 1.8L / 100KM le…… 0 to 100 at 6 sec. Wow! A superb design inside and out. Thoroughly modern and space-age ! Isn’t it the same Chinese company that produced the Haval cars, huh ?? No, Haval producer is Great Wall Motor. They produce chery eastar, tiggo.. I am going to sell off my CRV and buy this, if it ever comes to Malaysia. China car makers seems to take drastic move forward comparing to Jepunis overlords. Bravo! Take my money now Chevy! Fantastic looking!!!! Love it so much. Beautiful exterior and interior. Impressive performance and fuel consumption figure. Dashboard is beutiful, probably took some cue from Peugeot 3008 i-Cockpit. All round good, coming to Malayisia? What the f**k is wrong with this Chinese company? Shamelessly copying the award winning Kia Sportage design when they could just go an extra miles to copy the Cayenne or Macan for real! More Ah Bengs would pop their Cherry to buy this Cherry if only they copy the Porche rather than the Kia. Lol. hmmm…..i wonder did the chinese design this car or some other foreigners?